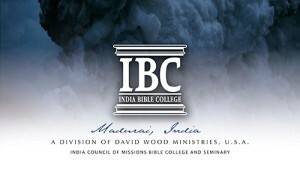 India Bible College produces preachers and church planters. Located in Melur Town, Madurai, India, IBC offers a complete two-year (24 month) degree anchored in Theology, while being packed with the practical How To courses on soul winning, Christian service, and church planting. Every student lives on site; many being abandoned by their family because of their faith in Christ. They attend at no charge. IBC is totally a faith work. Every graduate in the 12 year old history of the college has entered Gods work full time and is involved in church planting. Even their Christian service during their college training involves the planting of house churches after graduation. On January 19, 2012, IBC became a division of David Wood Ministries; Maintaining Thomas Maher, the India director of the Witness Project, as her PRESIDENT and invoking David Wood as her CHAIRMAN. Due to its national, on-site location, the TOTAL budget of the college is only $100 per month per student. Amazingly, this is only $2,400 per student covering all costs for a two year program and graduation. With a present capacity of 30 students, just 30 believers sponsoring a student at $100 per month will cover the colleges entire budget! This is a Major element in the Vision to evangelize all of India all 557 languages, dialects, and people groups. Please pray over your potential involvement in partnering with us; Whether it is a one time gift or the sponsorship of a student.